We wish all to be Happy, especially on Diwali. The surest way to make anyone Happy is to gift something super-special. We are Extra Excited , Classy Creative and eager to splurge on gifting for our dearest ones. Still Diwali Gifts are never easy to choose. Hardly anyone is pleased with what they receive as Diwali gifts. Expectations and Deliverables rarely ever match. Gifts , gifts Everywhere , but not a single one to excite our loved ones. Is this your dilemma too ? 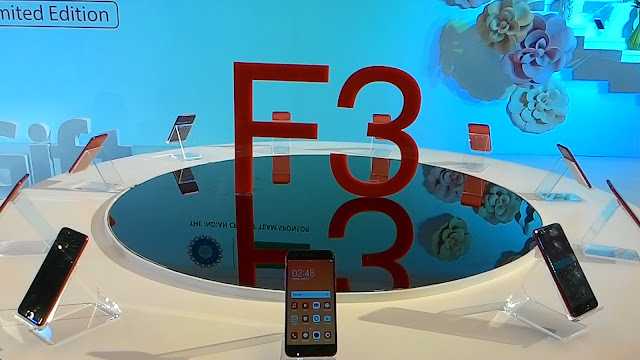 Worry not and have a look at this RED OPPO F3. I am sure you will love it at First sight and buy it the next moment. 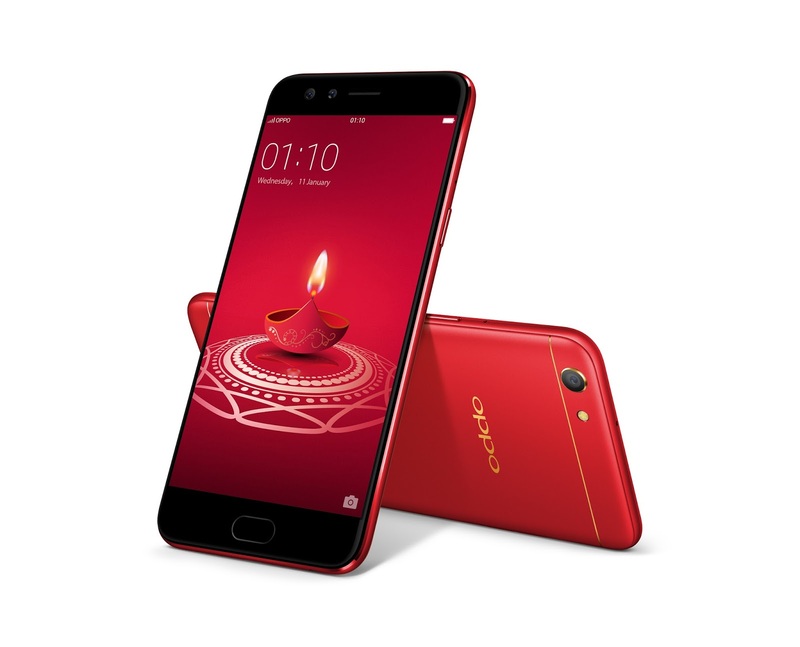 OPPO Mobiles, a Camera Phone brand, keeping the festive spirit of Diwali in mind, announced the launch of OPPO F3 Diwali Limited Edition today. 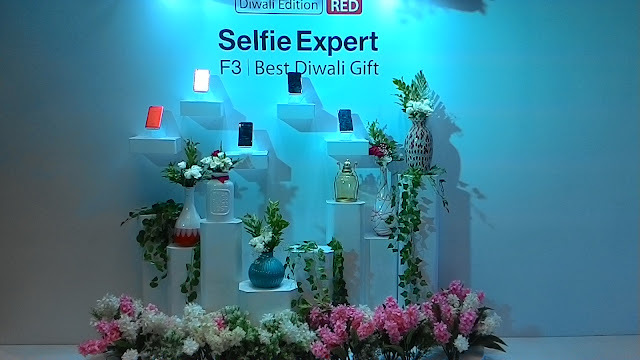 The Diwali Limited Edition phone, a red variant, is an extension of the original F3 and its price is set at Rs 18990. Every customer who will purchase the F3 Diwali Limited Edition would get an exclusive cricket bat signed by the Indian Cricket Team. 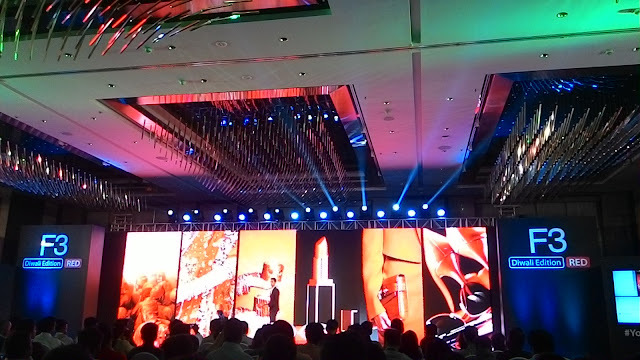 During the event, OPPO announced a new brand revamp – ‘The Selfie expert and leader’ in line with its achievements in the Indian market. Present in 28 global markets, now OPPO products and service are enjoyed by over 20 crore young consumers around the world. OPPO also revealed a brand new TVC featuring Team India cricket players – Virat Kohli, Rohit Sharma, Shikhar Dhawan and R. Ashwin, along with a Bollywood Diva – Elli AvrRam. The TVC shows the festivities that surround Diwali and the importance of the perfect Diwali gift which helps you capture your greatest memories. The new variant will be available from 29th Sepetember on Amazon exclusively and in OPPO offline stores across India. OPPO has been offering Selfie focused phones with revolutionary front camera technology since the trend caught on. According to The Nielsen Company’s report in July, OPPO is the leading Selfie expert in India, with the highest 39% top-of-mind-awareness of “great Selfies”. In Q2 2017, Counterpoint found out that OPPO F3 owns over 24.2% market share in INR 15K to 30K segment, which also proves OPPO is the Selfie expert and leader. OPPO F3 Diwali Limited Edition has been specifically designed to begin the celebrations of Diwali and shower your loved ones with gifts. The Diwali customized edition OPPO F3 comes in a stylish Red Color along with a shining metallic luster. Two thread-thin metallic bands have been widened to achieve a perfect proportion, with a customized golden painting technology. Meanwhile, the red texture is so bright and glossy that it reflects light. Bright and all metal red body – everything comes together to give an impression of youth, fashion and the beginning of the festive season. 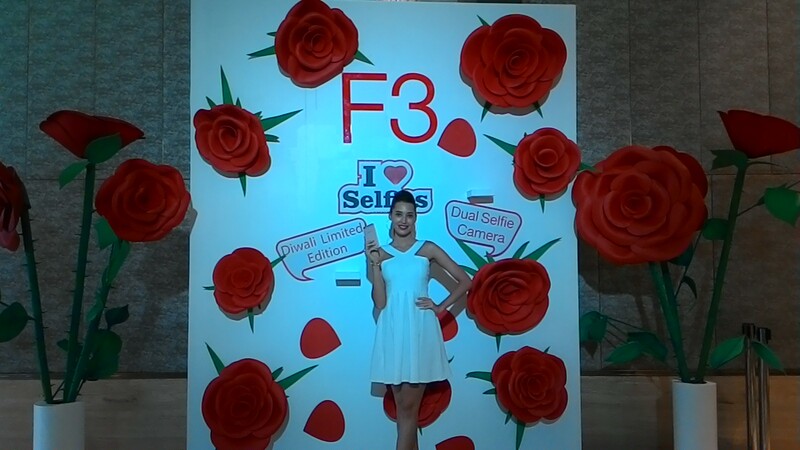 To provide the best selfie experience to users, the F3 supports dual selfie cameras – one 16 MP camera for regular selfie and one wide angle camera for group selfie. OPPO’s pioneering beautification editing software, Beautify 4.0 is available for both - two selfie front cameras and rear camera. For high performance, the OPPO F3 comes with 4GB RAM and 64GB ROM for smooth multitasking with enough space for more than 50,000 photos. The phone also has a large 3200 mAh battery lasting for more than 15 hours, according to real usage simulation tests. The OPPO F3 Diwali Limited Edition will be available from 29th September 2017 on ecommerce partner Amazon exclusively and in OPPO offline stores across India. Every customer who will purchase the F3 Diwali Limited Edition would get an exclusive cricket bat signed by the Indian Cricket Team. OPPO is a leading Camera Phone brand enjoyed by young people around the world. For the last ten years, OPPO has been focusing on manufacturing camera phones, while innovating mobile photography technology breakthroughs. OPPO started the era of selfie beautification and was the first brand to launch smartphones with 5MP and 16MP front cameras. OPPO was also the first brand to introduce the motorized rotating camera, the Ultra HD feature and the 5x Dual Camera Zoom technology. OPPO's Selfie Expert F series launched in 2016 drove a selfie trend in the smartphone industry. In 2016, OPPO was ranked as the number 4 smartphone brand globally, according to IDC. And today, OPPO provides excellent smartphone photography experience to over 20 crore young people around the world. Oppo looks fantastic.. I like the color much. Right Saravana , Oppo looks like iPhone and has better camera. RED color is Smashing. Hi Sujata, Nicely written article....Keep up the good work.